Lou Del Bianco's first-person account of his grandfather's work on the Mr. Rushmore presidential carvings, as Chief Carver, is entertaining, personable and very interesting. The conversational tone and lightly self-deprecating humor, combined with family photos, made this reader feel like I was an audience of one, enjoying a command performance by the author. The story of Italian immigrant Luigi Del Bianco's work on Mt. Rushmore takes up roughly two-thirds of the book. The other third is the frustrating and heartbreaking struggle the Del Bianco family (mainly Lou and his aunt and uncle) waged for 25+ years (YES! Sadly, it took that long!) to get the U.S. Parks Service to recognize the Chief Carver's role in the creation of the Mr. Rushmore presidential monument, and to commemorate that at Mt. Rushmore. 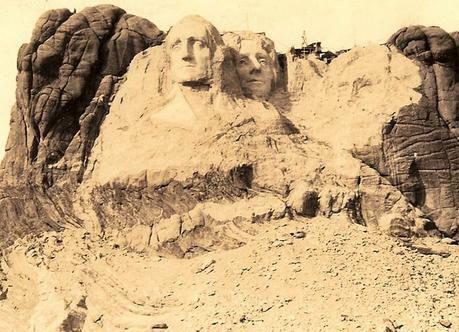 For those who don't know, Gutzon Borglum, a master-carver (and amazing self-promoter), artist and engineer, designed the memorial in South Dakota and convinced the U.S. government to foot the bill. He brought to the project expert carvers from his studio, all accomplished artists in their own right, to do the most delicate parts of the work. Chief among those artists was Luigi Del Bianco. Luigi Del Bianco was designated the Chief Carver by Borglum, and was tasked with not only training the unskilled miners who were hired locally, but with finishing the granite faces of the presidents so they came to life with rich expressions and amazing likenesses to the former presidents. Del Bianco was the only carver Borglum, who was too old to hang for long periods of time off the side of a mountain, trusted to do this delicate work in his stead, and entrusted to make the delicate repairs needed periodically in the friable mountain face. 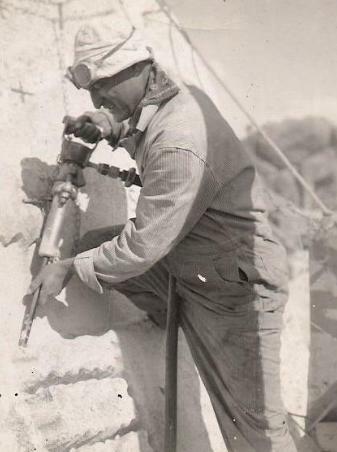 Luigi Del Biano working on Mt. Rushmore. The really amazing part of the story is that for decades Luigi Del Bianco was written out of the Mt. Rushmore monument's story, at least by the official historians. His community in Port Chester, New York, knew of their local son's talents and accomplishments, and regularly honored him in their press. But for the world at large, the Italian immigrant with the broken English was “officially” just one of the four hundred or so “workers” who did Borglum's bidding. Part of the reason for this was likely the out-sized ego of Borglum who saw the monument as his claim to fame. He died during its creation, and biographers liked to focus solely on the larger than life artist when discussing the larger than life presidential carvings. 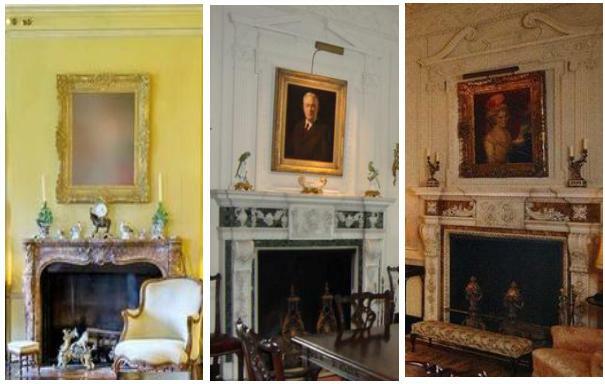 Luigi Del Bianco worked on the marble fireplaces in Kykuit, John D. Rochafeller's Pocantico Hills home in New York, some pictured here. Another part of the reason for Luigi Del Bianco's being kept in the shadows was certainly the contempt that immigrants were held in during the 1920s and 1930s, the time of the monument's creation, especially immigrants from Italy, who were also unfortunately Catholics arriving in a predominantly Protestant country. That bigotry was so intense in the U.S. at the time that it brought the Klan back to life in the Southern states, and gave it fresh ground to grow in the Western states. Oddly, Borglum was a supporter of the new Klan. I'd do it again even knowing all the hardships involved. Luigi Del Bianco made plinths for monuments in and around his New York area. Here is one he made, with one of his three sons and late-life-gift daughter seated before it. That's how this book becomes more than a biography of one Italian immigrant who helped create a modern masterpiece of monumental patriotic art. It becomes an iconic story of how an immigrant to America contributed to the country with his unique skills, hark work, and determination to succeed, supported by a community of immigrants who helped pull each other up, and by those open-minded Americans who recognized the rich talent that immigrants could contribute to the country. 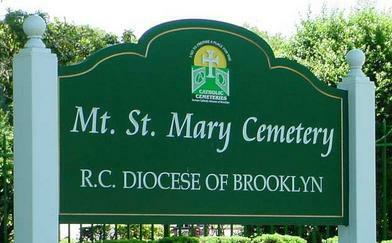 I suspect that for Luigi Del Bianco's New York community, a monument as great as Mt. Rushmore was certainly their local cemetery, decorated with over five hundred memorials to loved ones, carved with skill, talent and heart by their local, celebrated artisan. Immigrant, son, daughter and grandson join together in this book to tell a timeless tale of familial love, pride and the life of newcomers and their descendants. I highly recommend this book. Sometimes history does not tell you the whole story. When 8-year-old Lou Del Bianco finds out that his Grandpa Luigi was the Chief Carver on Mount Rushmore, his young life is instantly changed. Follow Lou’s journey as he and his Uncle Caesar make the painful discovery that Luigi is not even mentioned in the most definitive book on Rushmore. Cheer them on as you read the historic documents they unearth from the Library of Congress that not only tell Luigi’s story but also prove his great importance. Finally, ride the roller-coaster of the 25 year journey to get Luigi the recognition he deserves. 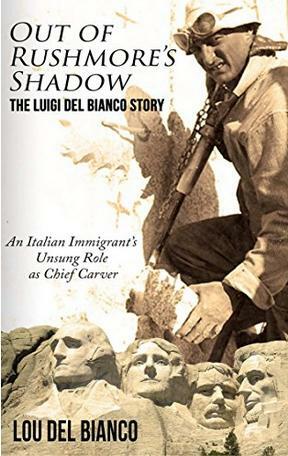 Out of Rushmore’s Shadow is the dramatic and touching story of Luigi’s legacy and the immigrant’s struggle. Please visit the Luigi Del Bianco Mr. Rushmore website for videos, interviews and lots of photographs. On this site I have a review of another book about Luigi Del Bianco, Mt. Rushmore and the era in which it was made, by the author Douglas J. Gladstone: Carving a Niche for Himself: The Untold Story of Luigi Del Bianco. 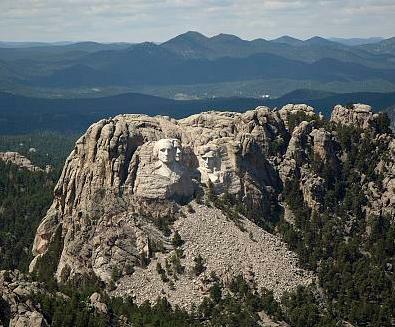 The Black Hills monument in South Dakota during the work, which involved blasters removing initial layers of rock, pointers marking the carving parameters based on the scale model in a nearby studio, drillers removing more stone, and carvers doing the final work to get the faces just right under the guidance of the Chief Carver, Luigi Del Bianco, who did the most delicate work himself.